The Historic U.S. Coast Guard Chimney Rock Boathouse. Chimney Rock is located at the eastern spur of the Point Reyes Headlands. The Chimney Rock area is a popular destination for visitors wishing to view elephant seals, birds, and wildflowers. The 1.75-mile (2.8-km) round-trip Chimney Rock Trail leads along the ridge crest of a narrow peninsula, offering spectacular views of Drakes Bay and the coastline stretching to the southeast. The historic Chimney Rock Lifeboat Station offers a glimpse into the harrowing jobs of rescuing crew and passengers from ships that ran aground along this rugged coastline. Fuel: The closest gas station is 20 miles (32 km) away in Point Reyes Station. Be sure you have sufficient fuel in your vehicle for a minimum 40-mile (64 km) round-trip drive, not including side trips to other points of interest within the National Seashore. Weather: Visitors may experience stiff winds, cool temperatures, fog, and/or rain at Chimney Rock; so dress appropriately. Wear layered clothing. Water: Bring a water bottle. There are no potable sources of water at Chimney Rock. The nearest potable source of water is a water bottle filling station/water fountain located near the east end of the green garages that are located approximately 100 yards (100 meters) before one arrives at the Lighthouse Visitor Center or a water fountain located in the courtyard of the Kenneth C. Patrick Visitor Center at Drakes Beach. Bottled water is not sold at Point Reyes National Seashore's visitor centers or bookstores. Food: There are no food services west of Inverness, which is a thirty-five-minute drive from the Chimney Rock parking lot. Bring food from home or purchase food at one of the stores or restaurants in West Marin before heading out to Chimney Rock if it is close to mealtime. Restrooms: Restrooms are available at the Chimney Rock parking lot from 6 am to midnight. Be sure to use the restrooms before heading out on area trails. Phones: Cell phone reception is very minimal to nonexistent in the Chimney Rock area. A pay phone is available near the west end of the green garages that are located approximately 100 yards (~90 meters) before one arrives at the Lighthouse Visitor Center and in the courtyard of the Kenneth C. Patrick Visitor Center at Drakes Beach. Drones: Launching, landing, or operating an unmanned aircraft, such as drones, from or on lands and waters administered by the National Park Service within the boundaries of Point Reyes National Seashore is prohibited. Pets: Dogs may be walked in the parking lot and along Chimney Rock Road west of the parking lot; otherwise, dogs are prohibited. Please be aware that most visitors to Chimney Rock are away from their vehicle for an hour or longer. Please do not leave your dog unattended in your vehicle; leave your dog at home instead. This prohibition does not apply to working service dogs, which are allowed on trails and in public buildings. If you have a service dog, please inquire at a park visitor center for information before heading out to the Chimney Rock area. Visit our Pets page for more information about visiting Point Reyes National Seashore with your dog. Sir Francis Drake Boulevard passes through a number of ranches on its way to Chimney Rock and the Point Reyes Headlands. Chimney Rock is located at the eastern-most end of the Point Reyes Headlands. Drive west ~19 miles (~30 km) on Sir Francis Drake Boulevard. After passing through the "A" Ranch, turn left at the Y signed for Chimney Rock and follow Chimney Rock Road ~0.9 miles (~1.5 km) to the Chimney Rock parking lot. Chimney Rock Road is only about ten feet (3 meters) wide, but serves as a two-way road. Please observe the speed limit and look ahead to keep watch for oncoming traffic. If you do notice a vehicle heading your way, pull into the next turnout until the other vehicle has had a chance to pass. Sir Francis Drake Boulevard is windy and slow-going, so allow forty-five minutes to drive the ~20 miles (~32 km) from the Bear Valley/Olema/Point Reyes Station area to the Chimney Rock parking lot (one hour and thirty minutes round-trip), not including any time you will spend in the area. Allow one hour and forty-five minutes for the drive (three hours and thirty minutes round-trip) from the Santa Rosa area, northwest San Francisco, or the northern East Bay. Many visitors spend at least an hour or two in the Chimney Rock area. Directions to Chimney Rock from the Bear Valley Visitor Center. Recreational vehicles (RVs) and vehicles pulling trailers with a combined length in excess of 24 feet (7.3 meters) are prohibited on Chimney Rock Road. If you are traveling with a trailer or are driving an RV towing a passenger vehicle, consider unhitching at the bus/RV/trailer-only parking lot at Bear Valley and taking only the passenger vehicle for the drive out to the Chimney Rock area. Overnight parking/camping in RVs and trailers is prohibited throughout Point Reyes National Seashore. The parking lot at the Chimney Rock Trailhead can accommodate approximately twenty vehicles. As a result, parking space availability is very limited, particularly in the afternoon. Please observe all "No Parking" signs. If you park parallel to Chimney Rock Road, please ensure that no part of your parked vehicle is on the pavement in order to allow other vehicles to safely pass. Be aware that the "shoulders" along Chimney Rock Road are often soft during the winter and spring and vehicles have become stuck in the mud when their owners attempted to park along the road. The parking lot at Chimney Rock is composed of dirt and gravel. The path to the Elephant Seal Overlook involves a rather short but moderately steep descent along a paved driveway, and then a flat traverse along a rammed-earth 0.2 mile-long (0.3 kilometer) trail. Individuals in wheelchairs may need assistance with the descent and accent of the driveway. Individuals with a Disabled Person parking placard or plate may drive their personal vehicle to the Lifeboat Station's Boathouse parking area. Please drive slowly and carefully since this section of the one-lane access road doubles as the pedestrian path from the main Chimney Rock parking lot to the Boathouse. Volunteers sometimes staff the Boathouse on weekends and holidays from January through March. The Boathouse's first floor and boat bay are wheelchair accessible. There is also an accessible restroom within the Boathouse. At other times, visitors may explore the Lifeboat Station grounds, where wayside exhibits provide information about the U.S. Lifesaving Service and U.S. Coast Guard history at Point Reyes. The only official trails in the Chimney Rock area are shown in the map to the right. Hiking along the bluff tops can be unsafe and is not recommended. Stay away from cliff edges. Loose soil and/or rock can give way suddenly and you may fall. Do not climb cliffs. Visitors walking off of official trails and paths trample vegetation, which may lead to the death of the trampled plants. Over time, as more and more visitors use a route, it starts to look more and more like an official trail, and more and more visitors use it, resulting in a feedback loop that makes the "trail" look "official." However, these "social paths" tend to exacerbate erosion and harm threatened and endangered species. These paths also can lead to locations where visitors may be more at risk to injury, endangering themselves and any potential rescuers. Do not "hop" the fences to get a "better" photo or for any other reason. Fences and other barriers are there for your safety. The bluffs and cliffs in the Chimney Rock are prone to collapse with little warning. Stay well away from the bluff tops. Individuals who are found on the wrong side of fences will be cited for entering a closed area. During the winter, hundreds of northern elephants seals can be seen from the Elephant Seal Overlook. 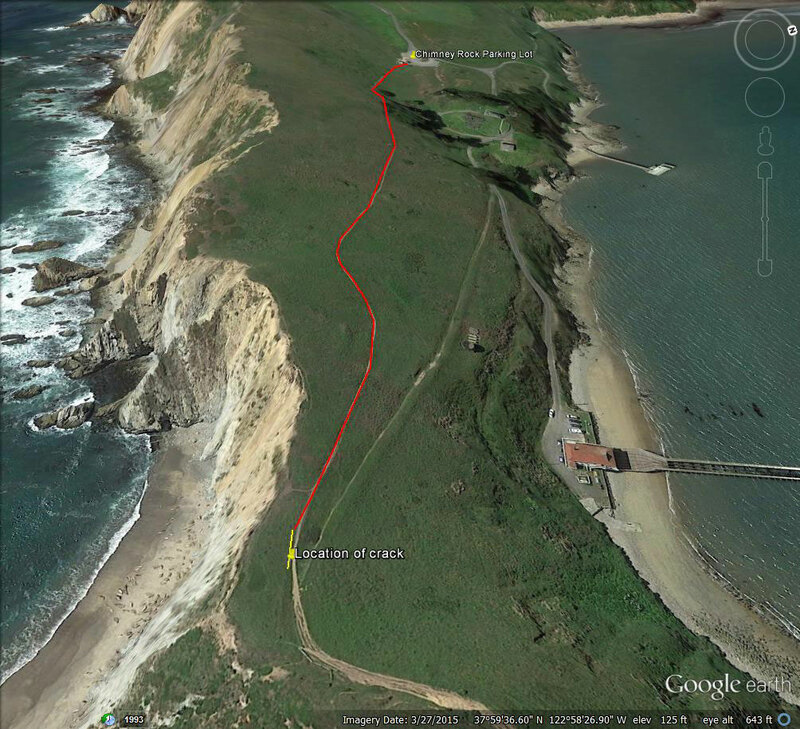 From the Chimney Rock parking lot, walk down the driveway 150 feet (~50 meters), bear left at the Y, and continue along the Fish Docks access road another 260 feet (~80 meters) to the trailhead for the Elephant Seal Overlook Trail. 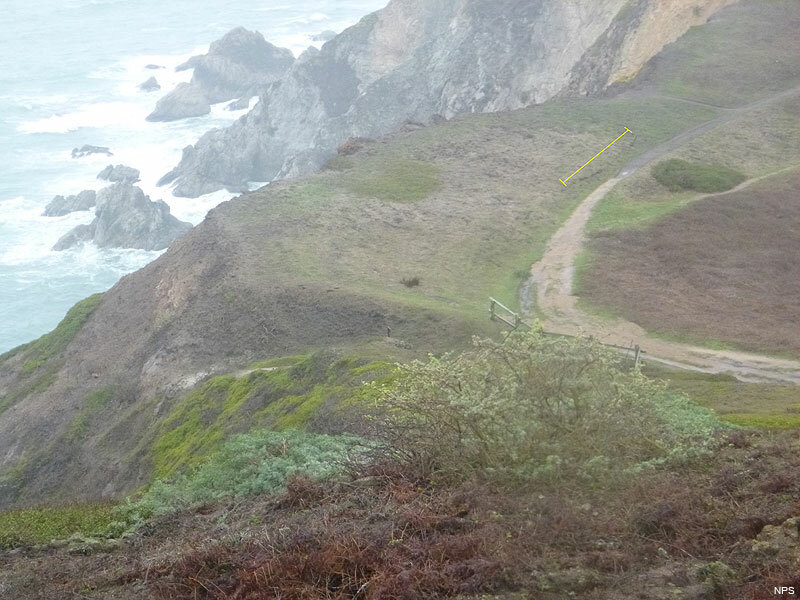 The relatively flat dirt trail leads 850 feet (~260 meters) northwest to the Elephant Seal Overlook. While it may be possible to view northern elephant seals from here on any given day of the year, December through March is the period during which visitors may view several hundred elephant seals hauled out at the southwest end of Drakes Beach as the seals return to give birth and to mate. On weekends and holidays from late-December through March, Winter Wildlife Docents are stationed at the Elephant Seal Overlook from 11 am to 4 pm. Visitors are invited to view the elephant seal colony through park-provided binoculars and spotting scopes and to ask the docents any questions they may have about the amazing adaptations and life cycles of elephant seals. Please visit our Viewing Elephant Seals page for more information. This spectacular 1.75-mile (2.8 km) hike offers views of Drakes Bay and the Pacific Ocean and is renowned for great spring wildflowers. Rocky cliffs drop off steeply to the water, so there is no beach access. While it is possible to see a few whales any given day of the year, from March through May, dozens to hundreds of gray whales migrate north past Chimney Rock every day. Fog and wind can make this hike challenging. Start this hike from the southeast corner of the Chimney Rock parking lot. 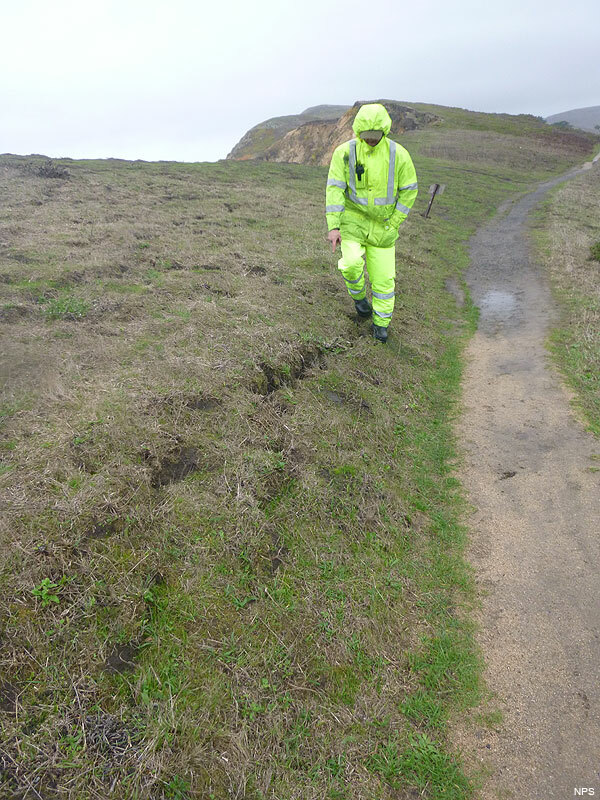 Photo of a park employee standing over and pointing at a newly developed fissure along the Chimney Rock Trail on December 21, 2015. Cracks were reported on a portion of the bluff near the Chimney Rock Trail on December 21, 2015. These fissures could indicate the possibility of a weakening cliff face in the area. The land may be unstable and a collapse or erosion could occur. Visitors are reminded to stay on designated trails. Bluffs along the California coast are inherently unstable. They are prone to crumbling and sliding, especially in wet weather. It is very dangerous to climb or walk along the edge of cliffs. Be aware of falling rocks if walking near the base of a rock face. Despite the efforts of the men and women who worked at the Point Reyes Lighthouse, which was constructed in 1870, ships continued to wreck on the rocks and beaches along the dangerous Point Reyes peninsula. In 1889, the U.S. Life-Saving Service opened a Life Saving Station on the Point Reyes Beach, the first of two built at Point Reyes. The U.S. Lifesaving Service was combined with the U.S. Revenue Cutter Service to form the U.S. Coast Guard in 1915. In 1927, the Coast Guard moved their operations moved from Point Reyes Beach to the protected waters at the southwest end of Drakes Beach near Chimney Rock. Eventually modern technologies eclipsed the need for the Lifeboat Station at Point Reyes. In 1969,the Point Reyes Lifeboat Station was closed and, shortly thereafter, was transferred to the National Park Service for preservation. Visit our Lifeboat Station History at Point Reyes page for more information. The Lifeboat Station buildings are visible from the Chimney Rock Trail and the station's access road (which is open only to NPS and other authorized vehicles). Visitors may explore the Lifeboat Station grounds, where wayside exhibits provide information about the U.S. Lifesaving Service and U.S. Coast Guard history at Point Reyes. Today, the Historic Lifeboat Station at Point Reyes National Seashore is primarily used as an educational facility for non-profit groups learning about the resources of the natural and cultural resources of Point Reyes. The Boathouse is sometimes open to the public from 11 am to 4 pm on weekends and federal holidays from January through March, if volunteer staff is available. The Boathouse contains the historic Coast Guard Motorized Lifeboat CG-36542 and has the last intact marine railway on the West Coast. Kids activities, a 10-minute video on elephant seals, and complimentary hot beverages (cocoa, tea, coffee) are available when the Boathouse is open, along with hands-on interactive activities allowing both children and adults to learn about seal and whale adaptations.